Typically, when I install WordPress, I usually install it in the root directory of the website. That is because I prefer not to host too many things under one domain name and I really don’t like overly long URL. Simply put, I like my blogs accessible via URL like http://example.com/ rather than http://example.com/my-wonderful-blog. Every time I need to upgrade, I find myself doing a lot of cross referencing to make sure I’m not deleting the wrong files. This time around, when I’m installing WordPress for SandboxBlogger.com, I’ve came across this instruction on the WordPress.org. What a great idea! Basically, this simple guide showed me how to install WordPress in a subdirectory off the root directory of the website yet the URL will still remain as http://www.example.com/. Also, all other files I place in the root directory of the website is still accessible via URL like http://www.example.com/sitemap.xml. Unzip wordpress package in the root of your website. Assuming the root of your website is ~/public_html/, you will now have ~/public_html/wordpress (wordpress unpacks into a subdirectory named wordpress). Move the wordpress directory to another directory name like myblog. I assume you will want to but if you don’t, remember to substitute myblog to the actual directory name you want to use. Proceed to install WordPress as the installation guide said and use this URL: http://example.com/myblog/wp-admin/install.php. Your blog will now have the following URL http://example.com/myblog/. Login and go to the Options panel. In the box for “WordPress address (URL):” you should see http://example.com/myblog/ leave that alone. 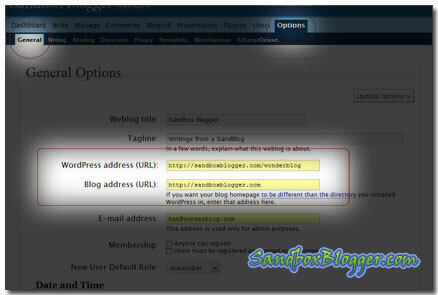 In the box for “Blog address (URL):” change the address to the root directory’s URL, like http://example.com/. Click on the picture below to see where in the WordPress Dashboard to make the changes. From the file system, copy index.php from ~/public_html/myblog/index.php to ~/public_html/index.php. Remember to also place all other files that do not belong to WordPress in ~/public_html/. Example files like robots.txt and sitemap.xml. I’m currently applying this tutorial to my blog. Two problems I’m having are what are all the necessary files that I need to move? and the .htaccess can be created like any file? Do I create a blank file named .htaccess? I don’t see a notify me of comment button. Can you email me once your reply please? The other two files that are required to be in the root of your site are the index.php and .htaccess. But instead of moving the index.php, you will want to copy that file from public_html/wordpress/index.php to public_html/index.php. As for the .htaccess, when you customize the url of your blog in the “Options | Pemalink” page, you are given the content of the .htaccess file after you have save the options. Just create the .htaccess with what WordPress has provided. Unless if you want to let WordPress handle that .htaccess file, just create an empty file and set the permission to allow access to everyone. I personally would just create that file with what WordPress provide. BTW, if you want to keep track of the comment on this blog or want to get notified of reply to your comment, you can always subscribe to the comments RSS feeds. The link is at the bottom of the footer on this page. Can I now go back and change the options as above to make the blog appear as if it was on the root? Will all my old posts be ok? For existing users, it makes no difference and the move is relatively easy. Just copy or move those files and make the configuration changes as in the guide. 3. i have only my .htaccess at my root directory so what i did was move the index.php file from public_html/wp to public_html. what happened is that i cannot access my example.com and example.com/wp anymore; i get a 500 internal server error. 4. i tried moving back the index.php to public_html/wp but still same error. 1. after i returned the index.php to public_html/wp, i then “copied” (not “move” anymore like i did the first time) index.php to public_html. 4. so what i did was remove that two lines and saved my .htaccess and when i tried typing my example.com url, my blog already showed! yey! I’m glad you have solve your problem but it seem strange the two lines in the .htaccess was causing the problem. Just curious, is your hosting service on a Windows server? http://www.mihcaelaulia.com to access WordPress, will the old link still work (../blogs/my-post.html) after I change the option? Interesting question. I’ve not tried it myself but I suppose it should work (Err… I mean I don’t remember). I’ll give it a try later and update the post. If you decide to try the move before I have a chance to try it out, please make sure you have your blog backed up before attempting the move. OK, I’ve had a quick test and unfortunately no, old link will not work without some .htaccess magic. If you need help with that, just let me know. I’ll probably write a post about it over the weekend. EDIT: OK, apparently it works. I don’t know why it did not work the first time I’ve tried it but it works. I’ve tested with WordPress 2.3.3 and by changing the blog location, WordPress will redirect your old link to the new link. The only exception is WordPress will not handle the home page. e.g http://example.com/blog will give you a 404 error after the move from http://example/blog to http://example.com. Ah I see! Really appreciate you for trying it out just for me! As for the question of whether to move your blog or not, I have the following to say. The usual reason why one would want to move a WordPress installation to a subdirectory is for reason of easier upgrade procedure. On the other hand, to configure WordPress to serve the blog from the root is mostly a matter of preference. Although some may argue that moving the blog to the root of the site is better for SEO but I’ve seen the same argument to keep the blog in a subdirectory call /blog/. I’ve also seen very successful blogs that are configured to live in root as well as in a subdirectory /blog/. So, to go with root or /blog/, it is really not a huge factor as to whether the blog is going to be successful or not. If your blog is new and you are asking whether to move or not, I would say go ahead if that’s your preference. However, I would say think twice if your blog already have good traffic and if readers are able to find your blog’s URL by going to the main page of your blog. I hope the above will point you in the right direction. If it is up to me, I’ll say don’t change. As for moving from /blogs/ to /blog/, I’d say change only if you have a lot of 404 from people typing in …/blog on the address bar. If you don’t get a lot of that, there is little point changing. I don’t really see the difference between /blogs/ and /blog/. Hey, I was wondering if you could help me out with something. I managed to successfully do this process from mobilegreen.org/blog to mobilegreen.org, but for some reason when I go to http://www.mobilegreen.org, I only have a blank page! Any help would be much appreciated. It looks like something you did cause an error. The question is what did you do different or what is different in your environment. By looking at your blog, there is no indication of what is the cause because there is absolutely nothing in that page. Please read through the tutorial again and point out anything you may have done differently. Also, is this is your initial installation or you have a blog going and you are trying to move the url? The other thing to look out for is, do you have any stray files in your installation? Example, do you have index.html in your web root? If so, check if those files could cause the problem you are seeing. hi. great info here! thanks! my problem is that i don’t have an .htaccess file…. at least not that i can see. and i’m not sure if i am understanding your instructions in comment #2. “As for the .htaccess, when you customize the url of your blog in the “Options | Pemalink” page, you are given the content of the .htaccess file after you have save the options. Just create the .htaccess with what WordPress has provided. Unless if you want to let WordPress handle that .htaccess file, just create an empty file and set the permission to allow access to everyone. I personally would just create that file with what WordPress provide. where do you see the contents of the .htaccess file? i’m not seeing that. The .htaccess content can be seen when you go to “Options | Permalinks”. You need to scroll to the bottom of that page. If you don’t have that file writable by WordPress, you need to create that file in the root of your blog and paste the content you find from the WordPress options page as mention above. thanks han! and i’m sorry to be such a bother, but what exactly will that content look like? is it the info that is in the ‘custom structure’ box? when i created the .htaccess in the root of my blog, i got an error page. thanks so much for your kind help! i installed the WP 2.6 at the directory (instead of the root) using fantastico install and changed the blog url to reflect the main url. i also changed the index.php as per instruction. as i cannot directly copy it, i uploaded the edited index.php via filezilla to the public htlml folder. i cannot see the ht access file from the directory folder, but it is in the root folder. When i view site, it is showing the hosting provider? I do not know how to figure it out as this is my first time to install WP. Further to my question, basically how do you COPY the index.php and .htaccess files from the WordPress directory into the root directory of the site? In my case, I did not see any .htaccess files from the subdirectory, the file is already in the public_html. I am getting error messages..
What you need generate the .htaccess before setting the blog address. The easiest way to do this is to change permalink. If you have the right permission, it will be updated for you. If not, WordPress will show you what to do. To change permalink login to the admin panel and go to the “Settings” tab. Next, click on “Permalinks” to change your permalink. You can pick either one of the pre-defined link format or “Custom Structure” and customize it how ever you like. If you don’t have the right permission on that directory (99.999% of the case), WordPress will show a text box at the bottom of the “Permalinks” page once you have save your new permalink format. In that case, you will need to copy the text in the textbox and create the file on your computer. You can now upload the .htaccess instead of copying over. Alternatively, you can also open up the .htaccess with cpanel in your public_html directory and modify it based on WordPress suggestion above. If in the event that you do have the right permission to create the file via WordPress, then you can continue with the rest of the guide and copy the .htaccess file to the correct location. Any ideas of what to do next would be most appreciated. Please disregard my last post. I turns out to be an issue of letter case usage. both are showing me the same page. I created one page called “BLOG”, published it, and then set it as Front Page by Options > Reading. I want to show welcome message, post titles, short description on Front Page. Sorry, the instruction on this post is not meant to address what you want to do. What you want to do needs to be done on the theme. Thanks for the great guide! It should work perfectly if followed correctly… AND you’re not replacing an old MT install, like I was. I followed your instructions and the index appeared correctly but all archived pages were appearing without stylesheets. I discovered that this was because the .htaccess redirects only take effect if the destination does not exist. I was still pointing to the old file structure from my old Movable Type install. As soon as I removed (or renamed) the old MT install and directories, the new .htaccess took over and everything was kosher. Thanks again for the guide! Hi, have a question. I’ve used this method for my site… wordpress installation is located in /blog. I’ve set it up via permalinks so that all my posts are under /blog/post-slug, and that all my pages are under /page-slug (root directory). root url pulls up /index.php, and /blog pulls up /blog/index.php (one is “home” page, one is recent posts). This worked well for me in WP 2.6… but I just upgraded to 2.7 and now am experiencing an error when I try to load the /blog page (I left a index.php file in the blog directory so that it could load recent posts). Any suggestion for fixing this issue? I just installed wp on my own domain. I followed your instructions and it worked.. however whenever I click on anything on the website like comments.. it shows it downloading to my desktop. The same problem happens in my admin dashboard. Anything I click on downloads the file to my desktop. Can someone tell me like a 5 year old what to do? I don’t know what happened but its not doing it anymore. Love this blog! but when i view it on the mywebsite.com/public_html, i see the website. Please let me know how to get the site on mywebsite.com only. Thanks much! Dear friend I followed your tutorial again and again without success, my colleague has also tried on localhost and managed to make it, but on the server the mission seems impossible. Would you have any idea for us or would you please like to have a look at it, if you don’t mind? There are a lot of ways a server can be configured and there are a lot of different servers out there with different feature set. Maybe if you describe how it is not working I could better pinpoint what is the problem. Also, provide information like what is the server you are using (apache, IIS, etc). What kind of hosting is it (Windows Server, Linux, etc). If it is apache, the prime suspect is that local overwrite of server setting is not allowed (.htaccess not allowed and not processed). Please provide details and maybe I can spot the problem. I successfully was able to change access to my blog from faux-beau.com/journal to just faux-beau.com but I would still like to access it from faux-beau.com/journal. You mentioned above that it was possible but I keep getting a 404. Any suggestions? I’m surprise that it works for you because the instruction is a bit dated. Especially for the screen shots. Ok, I found a tutorial on WordPress that tells me the exact same thing, however, you have a comment section. Maybe you can help me. My WordPress files already have their own directory on my server. I moved the two .htaccess file and the index.php file (after changing it) to the root directory. However, http://example.com will not show my website. It goes to the original register.com parking page. The only way to see the website is by going to http://example.com/wordpress. It won’t work any other way. I even experimented with putting the WordPress files in the root directory, but that did me no good. What am I doing wrong? I followed the instructions exactly, and in fact I was able to make it work for a different website I am working on. I should like to find instructions for doing this that work on a Windows Server (Windows Server 2008 specifically). It seems in principle that the same set of steps are required, but when the instructions talk specifically about the .htaccess file, that becomes inrrelevant because I don’t have one of those. I followed the steps as found at the Almighty Codex page at the WordPress web site and it broke my blog (no page displayed). So maybe there are Windows-specific gotchas? I was wondering. If the wordpress files are in http://example.com/wordpress, what should the contents of the robots.txt in the root directory be to prevent robots from accessing the wordpress files. etc. in the robots.txt file. I have not seen an answer to my previous comment #48. I am not sure because I do not understand how the search engine spider indexes the pages on a website. Does it go to the home pages and uses the hyperlinks to access other pages and posts or does it “see” the directory structure of a website and then access files. instead. Can you tell me which is the correct way to use? Thanks. I saw your workaround with Michael Aulia and was wondering whether it will work with my situation. I have several blogs running under one hosting with multiple domains. All is redirected but what if I want each blog to only show its own respective domain? Hi William, Mark. I’m sorry to say that I’m rather busy with work these days that I can’t find time to test out stuff I did when I have started the blog. If I don’t have immediate answers to question, I won’t be trying to find out. Sorry folks. I am having a problem with giving wordpress it’s own directory also. I have followed all the steps (except i don’t have a .htaccess file. but my permalinks are default.) After I go through all of the steps I can access my page from the new address but non of the links work. I have the index.php in the root and the rest of wordpress in http://www.mysite.com/public/. If I go to http://www.mysite.com I get the front page but the links all go to http://www.mysite.com/catigory not /public/catigory, so they all get 404s. I hope this is not confusing, cause it is starting to confuse me as to why this is happening. thanks. Hello I did everything here and when I try to access aicocolon.com/blog is not showing, its showing. Apparently getting error 404. I think I want to do the opposite. http://example.com currently takes people to my WordPress homepage. But what I want to do is have the root domain URL go to a different page and for the WordPress home page to have a URL like http://example.com/home. Can this be done? Thanks! Thank you for this post. In understand how giving wordpress its own directory is important. I wonder how can you do the same with your wordpress uploads such as images so that you can upload them in the wordpress directory but pointing out directly to the domain name. Hi. Thanks for your very informative tips. I need a favor though. I have a problem logging in to the wordpress admin. The website is fine though. This started when I copied index.php (and changed it to require(‘./blog/wp-blog-header.php’);) and .htaccess to the root folder and saved permalinks. I was intending to have people visiting http://www.domain.com see my website which is blog.domain.com (which is in a folder http://www.domain.com/blog. The only reason I considered tho option was because moving from /wordpress into / (over the top of an existing static HTML site) meant I would need to update all my links and image URls, removing /wordpress manually – a tedious and painful process! I thought tho was the solution however, all links that were originally inserted into posts are still linking to /wordpress/blah-blah/ and failing with a 404! You need to add one line in .htaccess to do a 301 redirect from the old url to the new. You would need it anyway because you have no control over external links to your blog posts.